If you’re planning a Disney Vacation, there are a couple things you absolutely need to know to get started! Sure we can share our favorite resorts, our favorite restaurants, checklists and our best tips and tricks but there’s no point getting super excited about booking the Be Our Guest restaurant, if you haven’t figured out what day of your vacation you’re going to be in Magic Kingdom. 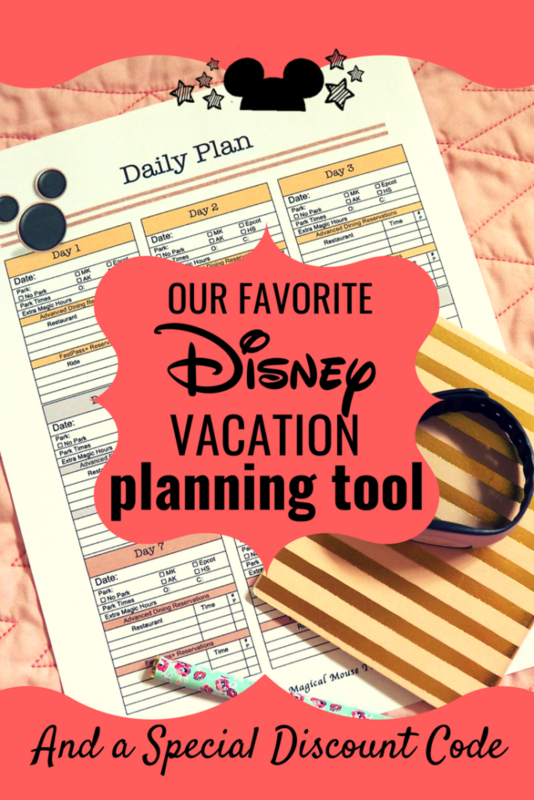 So we wanted to clue you in on the planning tool we’ve become addicted to for planning those extra special Disney vacations. So, let me just start by disclosing that my sister and I are like crazy planning machines. 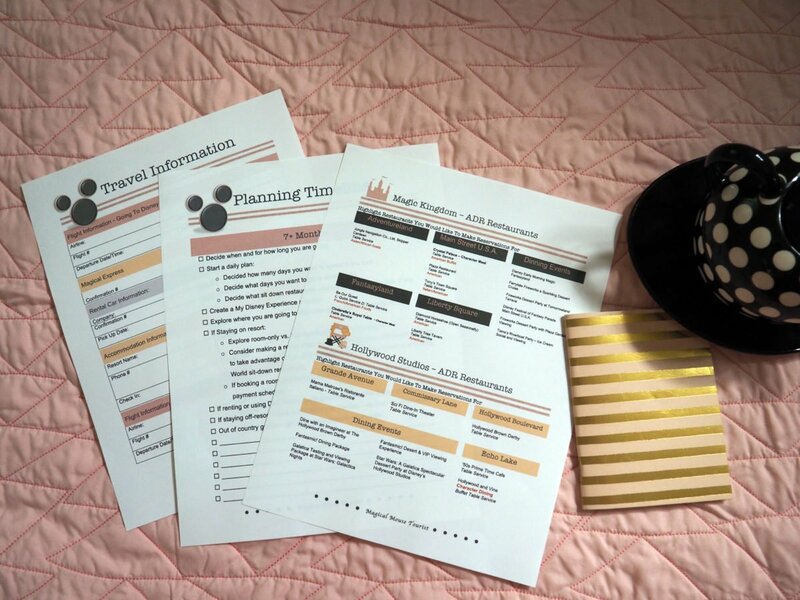 We love planning our own trips and trips for others and as expert Disney vacation planners writing this blog we always, always, always have a pretty iron clad plan… by the time the trip happens.But the journey to the perfect plan usually goes like this…. did we make the dining reservations already? Oh God, did we miss the magical express deadline? Which park are we in that day? Will we have enough time to grab the begniets from Port Orleans? Were we doing Animal Kingdom this trip? Wait, didn’t we already book Na’vi River Journey on Tuesday? See, it’s a little messy. And truthfully it’s not like you can’t keep track of all this stuff in the My Disney Experience App, but you can’t really PLAN IT in the app. For us, this whole process usually always includes paper, lists and sometimes even an excel sheet. Thankfully, we stumbled onto some absolutely amazing, comprehensive, Disney Vacation Planning Guides over at the Magical Mouse Tourist shop on Etsy. Having an etsy shop of our own, it’s always super exciting to find another Disney fanatic creating things for Disney vacationers. Ok, so why do we love it? Lets dig in. 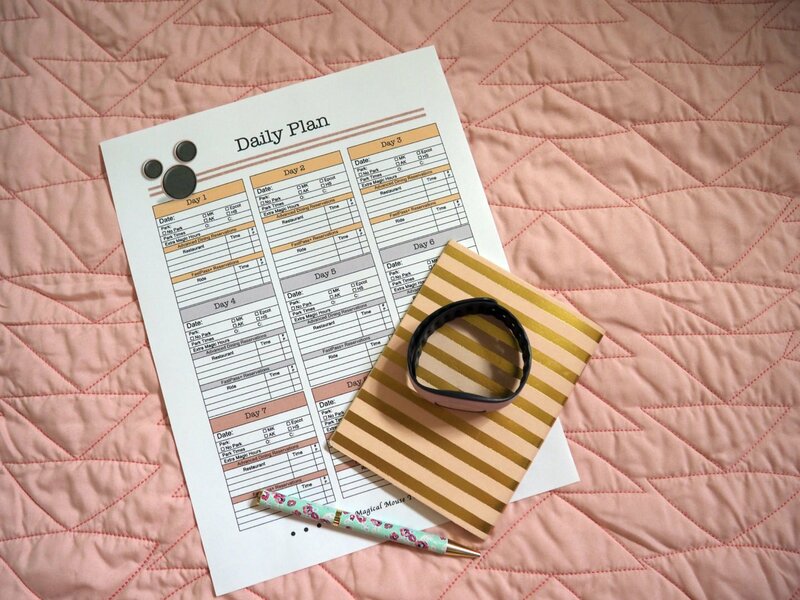 We became addicted to the Daily Planning sheet pretty quickly. While we loved having this all in one place, we were glad to have Day 1, Day 2, Day 3 etc. all on separate sheets too, so we could really dig in. It was so helpful to just automatically identify that we’d be visiting parks on the days we knew were best and write it down. From there the planning was easy! The Planning Guide includes a rundown of important dates like a countdown, so you know exactly when those Disney deadlines will pop up. It has sections for each park at Walt Disney World and includes the lists of restaurants in each, which need ADR’s and which don’t. It breaks down the rides and recommended fast passes for your tier one, tier two selections. 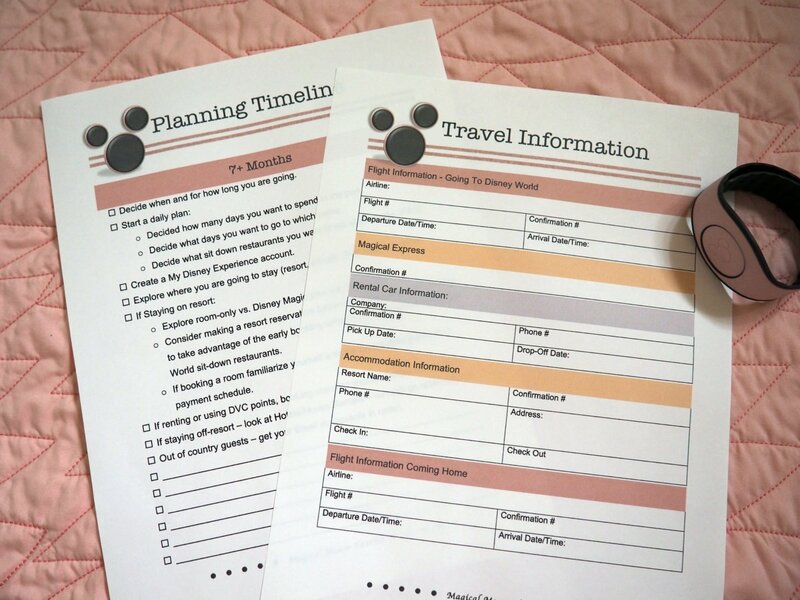 There are places for notes, and a master planning sheet for your entire trip and then also individual pages for each park so that you can plan out each park day. The guide we chose is 12 dollars and over 60 pages long. Here are some of the sheets you get included with your planner. 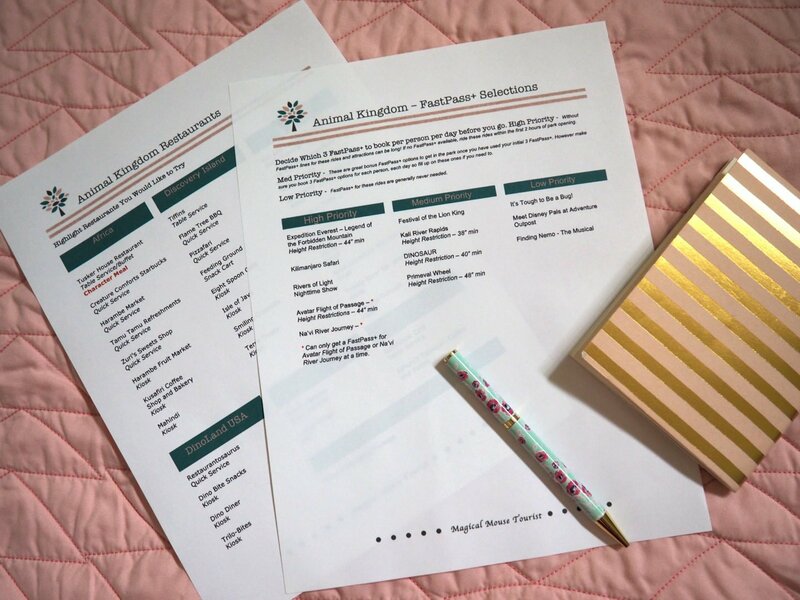 Package and Room Comparison worksheet. Your Travel and Transportation information sheet. Magic Kingdom park planner. Includes a daily Disney itinerary worksheet, ride and attraction guide, character guide, and restaurant guide. Hollywood Studios park planner. 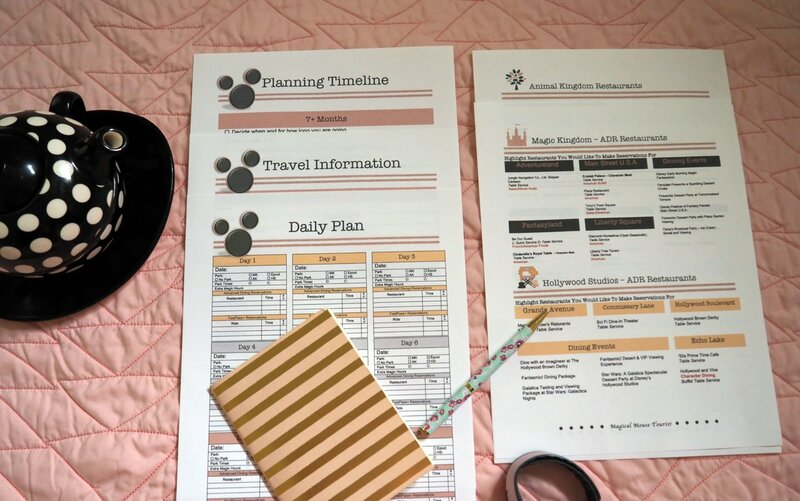 Includes a daily Disney itinerary worksheet, ride and attraction guide, character guide, and restaurant guide. Epcot park planner. Includes a daily Disney itinerary worksheet, ride and attraction guide, character guide, and restaurant guide. Animal Kingdom park planner. Includes a daily Disney itinerary worksheet, ride and attraction guide, character guide, and restaurant guide. Free Day Planner for non-theme park days. Table Service Lists for Disney resort restaurants, Disney Springs Restaurants, and Disney’s Boardwalk restaurants. Things to buy for your Disney trip list. Everything is already created for you and walks you through every single thing you will need to decide before your vacation. So comprehensive!!! The timelines here were such an added bonus! While we expected worksheets, we didn’t think we’d get the deadlines too. The guide has 7+month, 180 days, 90 days, 60 days and 30 day breakdowns. You’ll get sheets sharing the best restaurants in each park and which are critical for early reservations. More importantly it provides the road map of all your dining throughout the trip so that when your Advanced Dining Reservations open up, you can just look at the sheet and book them. When your fastpasses are able to be booked, you just look at the sheet and book them. If you see a cool new drink you want to try at Magic Kingdom, just add it to the Magic Kingdom sheet so you’ll be sure to remember when you’re actually in the parks. The whole product really is that great. The shop has planners for whatever planning level you need. From the 6 dollar range for just basic planning all the way up to the 400 dollar range for the official Disney Travel Agent. The guides are able to be instantly downloaded. We like to put on the pot of coffee and print the full guide and get to work, but if you’re more about just having the resource at your fingertips, you can download it straight to your phone for super simple in-park access. Ready to get started? Grab your Disney Planning Guide! Did we mention this shop has a Rose Gold version of this planner now? It should be no surprise to any of our followers that we like pretty things. We shamelessly stalk both Rose Gold and Millennial Pink trends wherever they show up and post them everywhere. So we naturally got the rose gold version. You can also grab this is in a very comprehensive Rose Gold Planner Excel Download if you’re really ready to dig in. Use Code PIXIEMAGIC for 25% off at Magical Mouse Tourist on anything in the shop. After you grab your planning guide from the shop, print it out and get started. You can also get the excel version if you would rather fill everything in on the computer… so many options! Either way, we love that the guide encourages us to figure it all out in one sitting! Happy Planning!